Samsung Music is getting a One UI makeover today with an update that the company has released for the app. Samsung Music isn’t the first proprietary app that the Korean giant is updating with the One UI design, nor will it be the last. 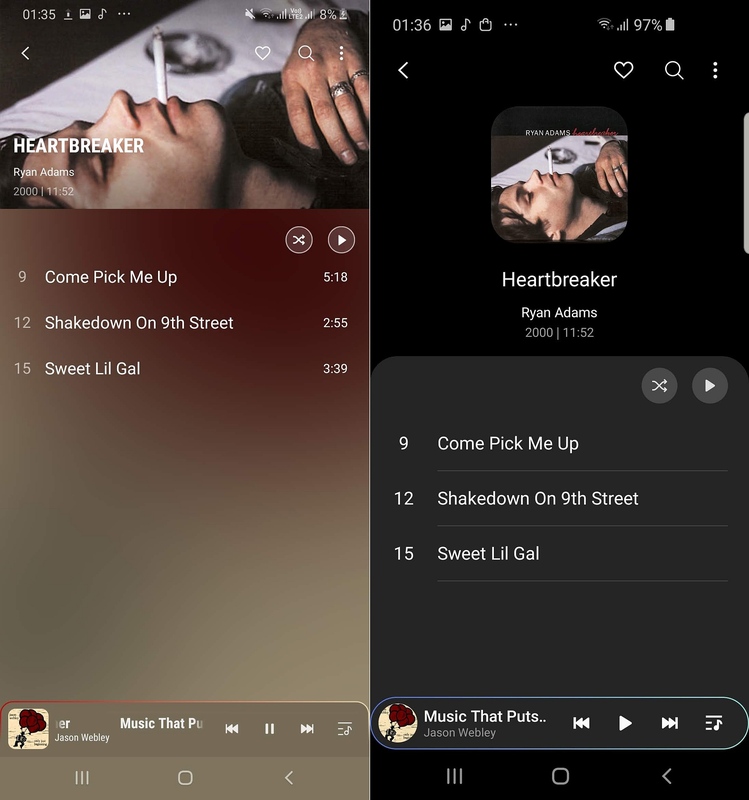 However, the changes seem to go deeper in Samsung Music; for example, the app changes to a dark UI when Android Pie’s Night mode is enabled and switches back to a bright interface when Night mode isn’t active. And it looks beautiful in our opinion. The update doesn’t bring anything else apart from the One UI design, although the interface makeover is a big change in itself. We have put together a couple of screenshots (the second and third image below) showing the old interface alongside the new interface (the new one is on the right in each screenshot). The Samsung Music update can be downloaded from Galaxy Store and is also available as an APK on our website for those who don’t see the update in Galaxy Store yet. The Play Store version hasn’t been updated, either, but that should change in the next day or two. 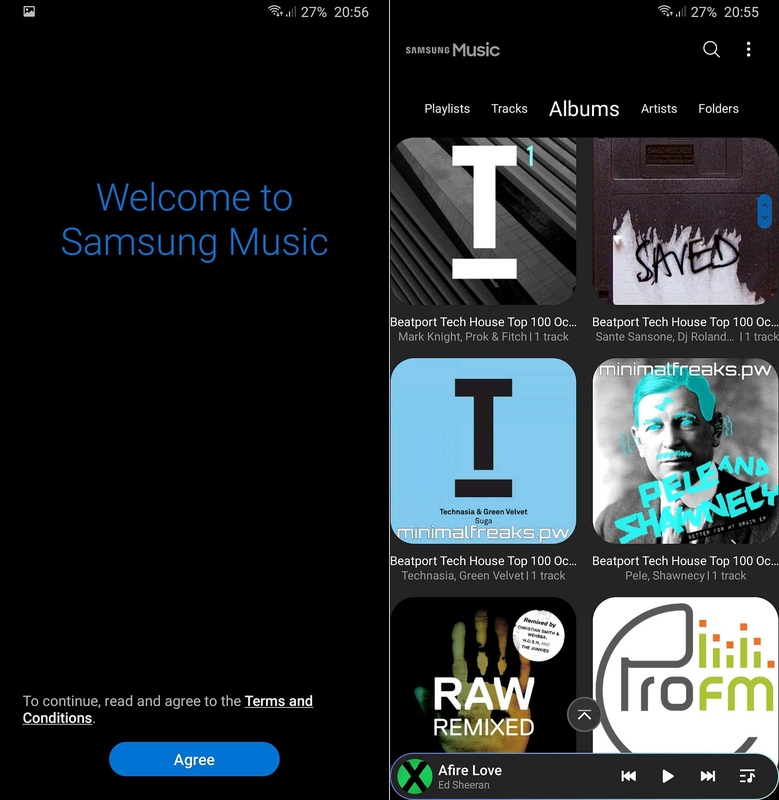 What do you think about Samsung Music’s new look? Change this info on apk page. “What do you think about Samsung Music’s new look?” Well there’s no poll on this article. So, many people can’t tell you though. Me for one, the previous version is better in many ways. Perfect on my S8 (Android 9.0) with the light and night modes. You mean about edge lighting ? love the colour effect when song is playing. only visible on light mode. but little disappointed when edge screen effects are gone. The color scheming on this version is horrible. No way near Google Play quality. Also, what happened to the edge lighting and the “3 columns” album grid layout? Nope, I’m going back to older APKS. 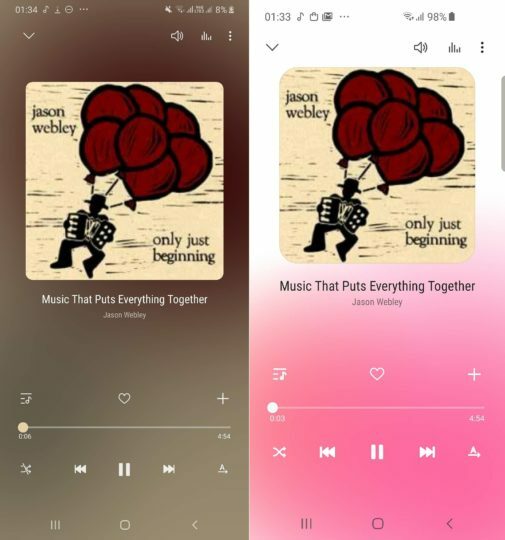 It’s personal but I realy dislike the new theme colors with this new version, album/track theme colors looked so much better on the formal version… But when you stay on the formal version, an annoying pop up almost force you to update to the new version everytime you open the app. I do hope they will give an option to change the colors or to stay on the formal version. i for one am very disappointed after they removed edge lightning effect, that was one thing gave it life while playing music and differentiated from other players out there. THIS!! I 100% agree with you mate. I loved the edge lighting the same colour as albums. I can’t tell if I have this update or not… Samsung music hasn’t updated in ages, but it looks very similar to this. The font is different and that’s about it? I haven’t got this update yet but I’m looking forward to it. I absolutely love the One UI dark mode. Update :”Just downloaded the apk. Looks great! No update in Galaxy Store. NO DARK MODE WITH THEMES WHY???? Yes because when you have a theme enabled, Samsung apps change to light mode e.g Samsung internet browser and in your case Samsung music player. I agree. Looks better than the previous version.